Eastern Tajikistan's magnificent Pamir Mountains viewed from the Pamir Highway. Tajikistan is the smallest of the seven "-stans." It's about the size of Greece or Illinois. Mountainous Tajikistan almost matches Nepal and Bhutan as having the highest "average elevation" of any country in the world. It's had plenty of problems since gaining independence when the Soviet Union collapsed in 1991 but it is a fascinating and friendly place to visit. Having lunch just below a waterfall with good guide Behzad and good driver Nios. Tajik waterfall lunch with plov. I'd wanted to return to Tajikistan since visiting Khojand in the north in 2012. 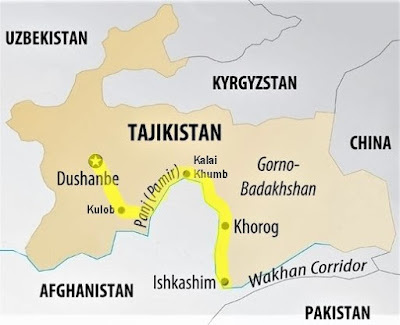 (3) and to use Tajikistan as a base for venturing into northern Afghanistan. See previous post. So as you can see on the map above, starting and finishing in Dushanbe, I took the bumpy little Pamir "highway" along the Panj River and witnessed the soaring Pamir wilderness. Almost at the gateway to the Pamir spectacle, we hit a roadblock, literally. Chinese workers blockaded the highway for the whole afternoon. Waiting, walking around, taking photos was fun the first hour. The next three hours in the hot sun, not so much. we enter a world of astonishing nonstop natural beauty -- for hundreds of miles. This particular geology was not so typical but memorable obviously. Around any bend you might see a new combination of some or all of these elements. Sometimes the mountains were sheer towers of rock. When the view was just the brown river and brown rocky mountains, the almost monochrome photos did not capture the actual rugged power (although good shadows helped). Where green space opens up between the mountainside and the river, people of the Pamir have built villages. South of Khorog, we stopped at a popular hot springs. ...but more often the Panj has treacherous rapids and deadly currents as it plummets thousands of feet from the high mountains. 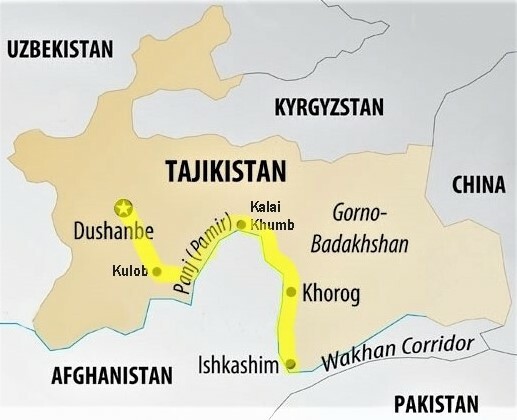 The Panj demarcates and polices most of the Tajik-Afghan border. Afghanistan is only about 40 meters/yards away here. Overflow pond offered a perfect mirror while the Panj races on farther way. As I walked around little Ishkashim, the girl in blue, with confidence and poise, came over to welcome me to town, introduce herself and then each of her shy playmates, and suggest that I probably would want a photo of them. 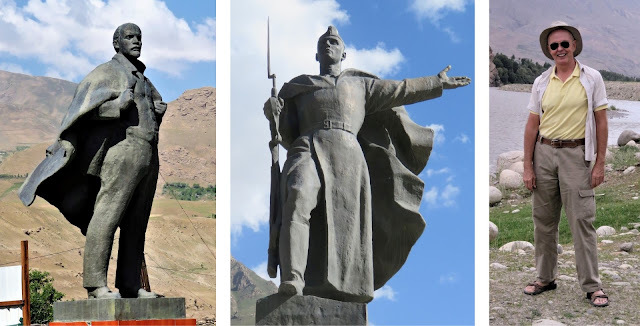 Many, many pictures of the President-for-Life aka "The Founder of Peace and National Unity, Leader of the Nation, President of the Republic of Tajikistan, His Excellency Emomali Rahmon." third guy has no pending statues. One last shot of the Pamir Mountains scrapping the sky above the Panj River. In the evening, crowds gather around the multicolored fountain in the park across from the big Soviet-era Ayni Opera House in Dushanbe. Attended drawing room performances in the Opera House. The young woman in purple was outstanding and stole the show. Bottom: Dushanbe viewed from my hotel room. 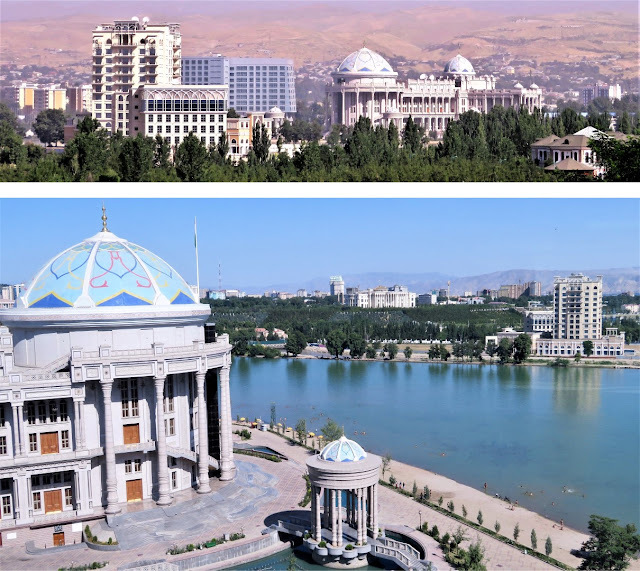 Dunshanbe is not what you'd expect for the capital of a small developing country. It has wide boulevards, tree-lined streets, large manicured parks; many fountains, and big monuments. 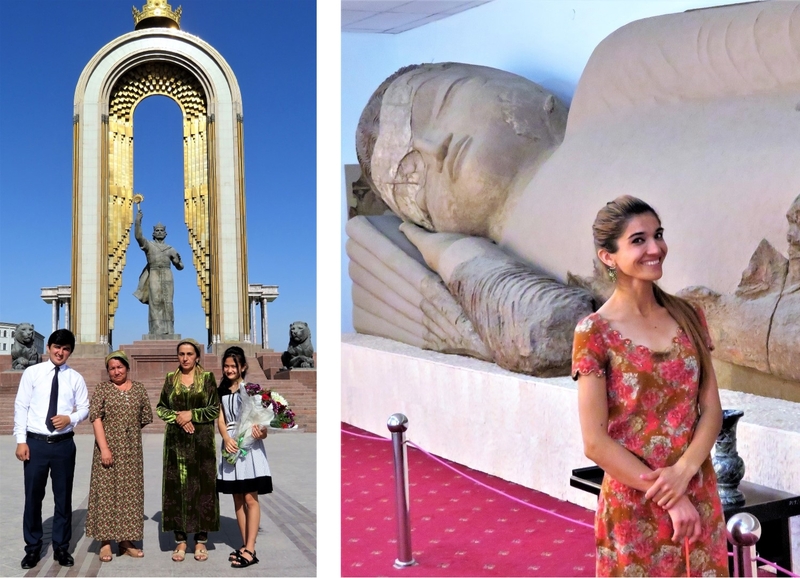 Local visitors at a monument to Somoni, the father of the Tajik nation. At the Museum of National Antiquities, Kamila, best museum guide ever. Could complications have arisen between Qatar's strings attached and the Tajikistan regime's fear of Muslim unrest? Best chicken kabob ever. Returned twice more and always perfection. Alas, food outside Dushanbe was short on edible protein. Women's landscape maintenance crew taking a break at Fort Hissor. To my surprise, they agreed to be photographed thanks to the friendly woman in green.